Located near the romantic City of Dahlonega the home of the first Gold Rush set in the Blue Ridge Mountains. Visit farms on the river, waterfalls, a quaint village and stay in a forested home right in the mountains. Great studio. Great locations. The 5 day workshop with Morgan Samuel Price was the single best experience in helping me to take a “leap” in my painting skills. Morgan shares more information than I have encountered with any other instructor. She covered everything from design to the pressure used when holding your brush. Each critique was very specific to each artist. Morgan pointed out the good points of each painting and gave direct advice to improve the artists skills. She was enthusiastic, energetic and always available. I would whole heatedly recommend studying with Morgan Samuel Price. Morgan Samuel Price is the most giving and generous teacher that I've had the pleasure studying with! Morgan is not only an accomplished masterful artist, an esteemed judge, she is a highly respected teacher!! Morgan has a passion not only to educate and mold your artistic abilities, She is thrilled to help you learn and retain skills that will propel YOU to a higher level of personal success!! My life changed after my first 5 day workshop, I had to go back for more!!! Dear Morgan, I'm taking this opportunity to thank you for a most amazing workshop here in Naples, Florida. I don't know where to begin. From the moment we met at the meet and greet, your warm welcoming smile and your genuine interest in getting to know each and every student, even prior to the workshop, set the stage for the individualized teaching that would take place over the next few days. It felt as though you truly understood each of our strengths and weaknesses, and did the best you could to help us work within those parameters. You are not only a wonderful artist, but wonderful woman as well. I feel so fortunate to have studied with you, and look forward to doing it again. Along with being a great painter, Morgan is very articulate and thoughtful in all her painting. There are many great painters, few of whom can also teach--Morgan is one of them. She sticks to basics--values, values, values. and design. Without a genuine understanding of these two concepts, painting a successful picture is impossible. She practices what she preaches--from her initial drawing she is constantly evaluating the design and correcting the values of a painting. She is attentive to each individual student, always patient and generous in her advice. 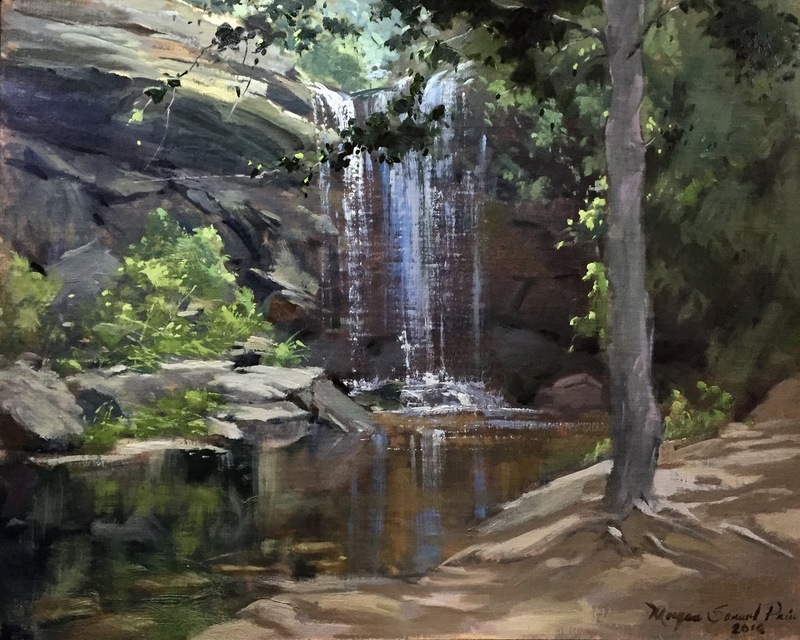 She helps you from start to finish--whether it's battling the challenges of plein air painting or struggling with a design, she has the answer. Morgan's teaching method is straightforward and will give you a map to follow. She's one of the best plein air teachers I've ever had--a true professional teacher and painter.